I love some of the modern calligraphy we are seeing in bullet journal spreads. Of course even as an artist I am not great at this though I am practicing more and more these days. So I’ve decided to share some of my favorite and best lettering tutorials. I highly recommend that you use something like Crayola Super Tips while you are practicing your modern calligraphy. The tips will get destroyed, they won’t last long, but at least you can get in some practice on an item that doesn’t cost an arm or leg. No matter how fantastic the Tombows are, a newbie will most likely destroy those tips while they are learning. Once you start getting the hang of the pressure then you can move on to the expensive and amazing brush pens. I recommend the Crayola Super Tips to start your hand lettering process. From there get the Scribbles That Matter Brush Pens, they aren’t as great as the Tombows but while you are practicing and honing your techniques they will work well. Finally, if you decide to, get the Tombows when you are confident in your brush lettering skills. There are plenty of people who continue using the Crayola Super Tips even after practicing and using brush pens. The Crayola Super Tips are inexpensive, easy to use, and have such great vibrant colors. As far as paper goes, while you are practicing get cheap printer or copy paper. It’s a great way to practice without spending loads of money. Now that you know what supplies you have we are going to dive into a few newbie tricks I’ve already learned on this lettering journey. There is no reason why you can’t outline a font and fill it. While you are learning modern calligraphy but still want artful fonts in your bullet journal, try just drawing them out. I’ve been doing this with a couple of spreads and I almost prefer it. It is faster to do modern calligraphy for sure but there is a calming aspect to hand drawing your calligraphy fonts and coloring them in too. You can also try mimicking non script fonts as well. Go for a modern thin font and mimic it. Create similar handwritten fonts and get creative. Finally, create your own worksheets by doing variations of fonts in different levels of grey. Then trace, learn, and practice the font with your own created worksheets. I am naturally heavy handed when I write, the hardest part for me was learning how to do heavy pressure during downstrokes and light pressure during upstrokes. It’s a learning cure from your normal writing so make sure you practice often with your pressure. One thing that helps me is to do all the down strokes in a word first and then complete the letter by adding the light pressure and thing upstrokes to each letter. Another way to practice your pressure is by practicing different flourishes that you can use. When you normally write you probably keep your arm in one spot and just move your fingers or wrist with each letter. In hand lettering it helps to keep the pen position the same and move your entire arm. This creates stability and straighter lines. If you are moving your wrist instead of your whole arm you are changing the position of your pen and may lose the thick downstroke and thin upstrokes. The nice thing about this is your hand will be less likely to cramp as quickly because you will be holding it in a more natural relaxed position. For help on learning how to do modern calligraphy with Crayola markers this video really helps. I have a forewarning about the tips of Crayola markers though. You need to use a lot of pressure and the tips can bend or disfigure. If you hold the cone to a piece of paper and roll it you can sort of shape it back to original. Always have extra pieces of paper to help reshape your tips as you go. While I use my Super Tips to learn how to do modern calligraphy I also use them to color in designs too. The fact that they are water soluble is a major plus for helping to create some cute watercolor designs with your fonts too. Follow this Instagram account to get tips on brush lettering. Alyssa gives some amazing tips for creating thick down strokes and thin upstrokes as well as how to join letters and create them. Unlike in cursive, calligraphy requires the pen to leave the paper to create each stroke individually. When you are ready to really dive into brush lettering you will want to check out ByDawnNicole. 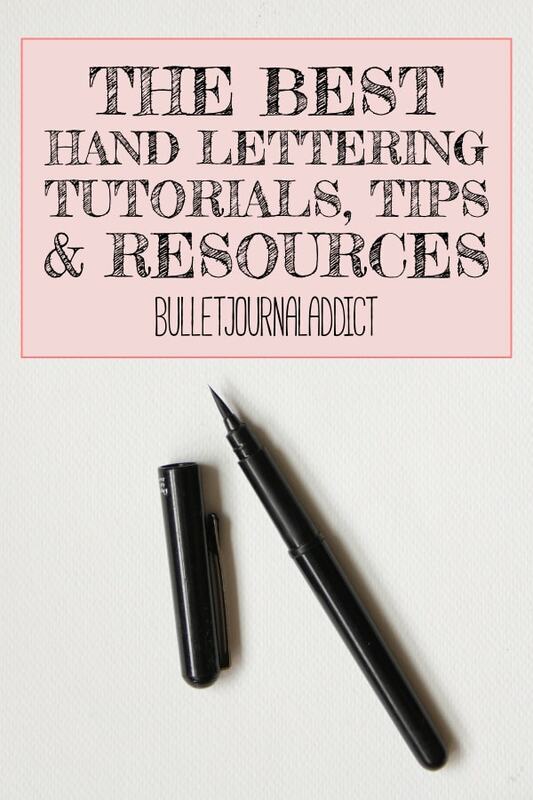 She is the ultimate resource for learning how to do brush lettering. She will have her own recommendations on pens but remember it all comes down to find the ones that work well for your natural pressure and personal style. Make sure you check out all of her worksheets and use them to practice your own brush lettering technique. She also teaches you how to do lettering on an I-Pad which is a fantastic way to create new printables, cards, and signs for friends and family. Little Miss Rose has an amazing tutorial on creating hand lettered fonts. These fonts are thin and modern and are easier to recreate. Her tutorial gives you a way to embellish fonts too. With her help you can create unique and pretty fonts to your bullet journal without needing to know how to do brush lettering. The majority of these fonts will pair nicely with brush lettering later when you are well practiced in it too. Hand lettering is a fun artistic hobby that leads into beautiful signs, printables, and bullet journal spreads. The key to successful hand lettering really boils down to just practice. Keep practicing your hand lettering and never stop practicing. Take the tips from some of the experts in this post but don’t be afraid to get creative and try your own thing. You may find a certain technique works well for you or find your own technique in the process. What do you struggle with in hand lettering? Let me know in the comments below. Do you have bullet journal spreads you would like shared? Email them to [email protected] and they may be featured on an Instagram post and/or to the blog. Please leave your IG Username so I can tag you in the posts. Follow me on Pinterest for more like this and pin this to your Bullet Journal boards.